Description: Explore the beautiful story of Natalie and Olivia on their Social Media Adventure. Try this amazing fashion challenge, and dress the girls up in a given style each day. Then they'll need you to take pictures like a real pro photographer. 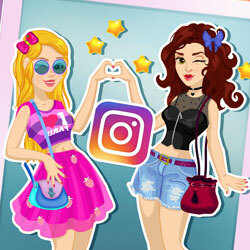 Get more and more likes and discover all the stickers and filters for your account, while on Natalie and Olivia's rise to social media fame!